One of the most enjoyable things for me, since beginning nature study with my children, has been keeping a nature journal. I am not nearly as consistent with it as I'd like to be, but it brings me a great deal of pleasure when I'm able to sit down with my colored pencils or watercolors and add a picture. I also like to try to write things in it, such as today, when I heard a Carolina wren singing on my front porch (loudly) and saw another one on my window sill with a piece of what looked like mulch from my flower bed, obviously headed for its nest. 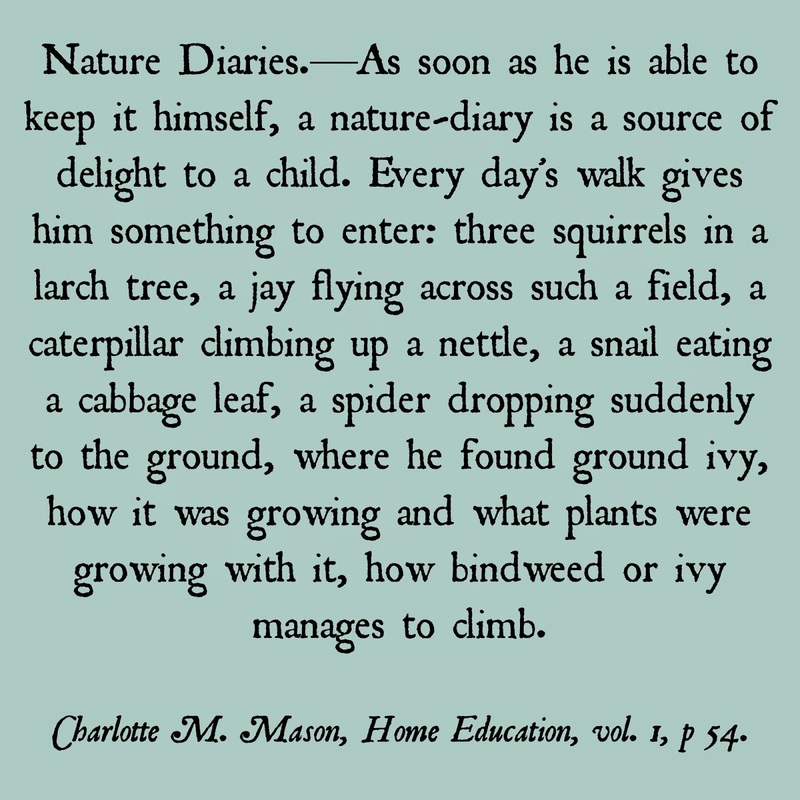 I was first introduced to nature journaling at the Charlotte Mason Institute Conference a few years ago. A lovely woman named Deborah Dobbins and her daughter, Holly, took our class on a nature walk, and instructed us each to pick a specimen to record in our journals. 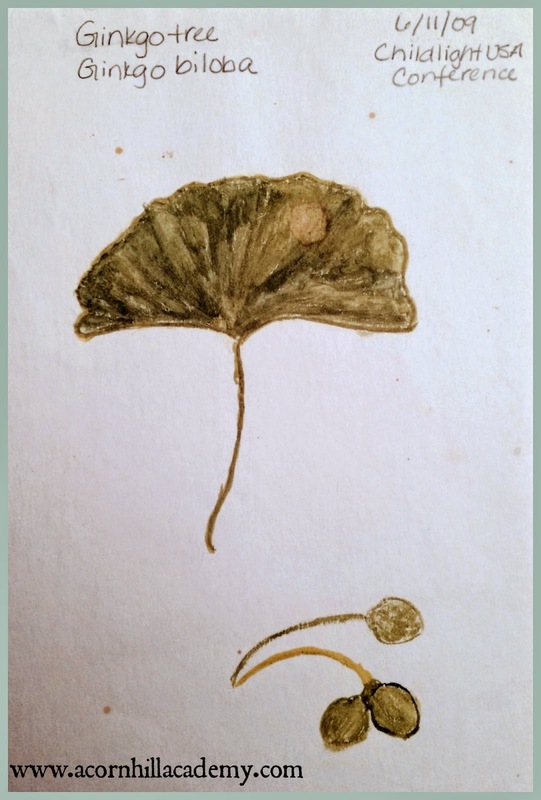 I chose a ginkgo leaf and seeds. When we got back to our classroom, she had us sit and look closely at our specimens for one minute, noting every detail we could see. Then we got to paint them in our books, using the dry brush technique with watercolor paints. (In a nutshell, you use a very small paintbrush like a pencil, using as little water and as much pigment as possible.) It was a lot of fun, and after taking the time to carefully observe my leaf, I noticed many more details about it than if I'd just picked it up and started painting. In our little Charlotte Mason co-op, we have been learning more about the dry brush technique and mixing colors. We've learned that in order to mix colors that are as true to nature as possible, we need to use CMYK colors, rather than the "primary" colors we normally think of. My friend Sara, who is in charge of nature study during our co-op time, found that she could not mix the color of a henbit flower from the paints she had, and that's how she learned she needed magenta, rather than red. (Here is some nice information about CMYK colors.) I invested in Winsor Newton Cotman watercolor sets for myself and my girls (Cotman are the less expensive version, also available at craft stores), and found that they didn't come with magenta (Permanent Rose is the WN color name) so I've ordered some for us. We have also used Prang watercolors and liked those too. You can order a magenta from Prang, as well, but we haven't been able to determine if they have anything comparable to cyan. We use Canson Field Sketchbooks (aff. link) for our nature journals. They have a nice hard cover, and the paper holds up well to painting. Plus, they're readily available at local craft stores and I can almost always find a coupon! If you can't purchase one right away, you can make your own. Here is a fun tutorial from the National Wildlife Federation. We've used both colored pencils and watercolors. 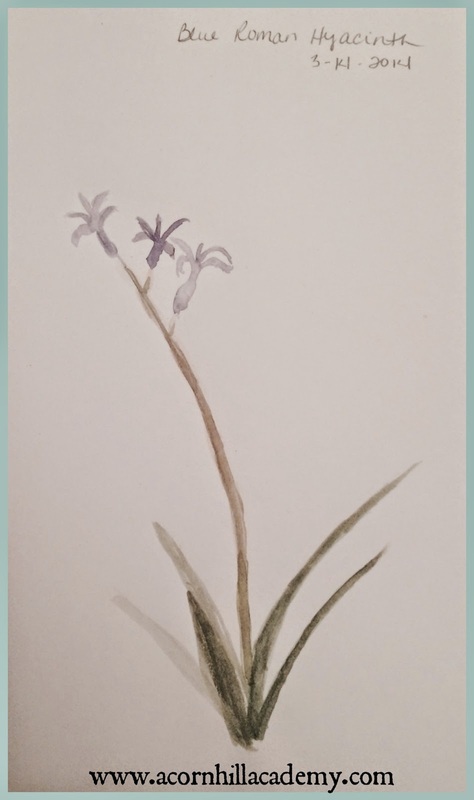 I find pencils to be more convenient when we're outside on a walk, but I like to have us work on our dry brush painting, too, when we bring specimens back to the house. I'll be honest: we find dry brush much more challenging than drawing and coloring with pencils, but it's an important thing to practice. You really have to pay attention to what you're doing with dry brush. 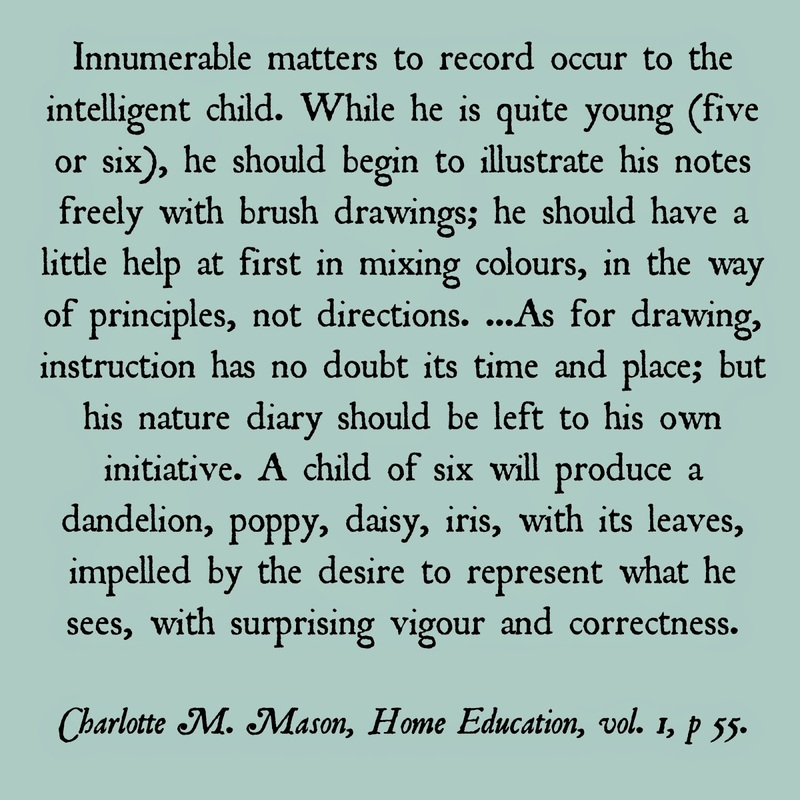 And, as we discussed at our last CM book club meeting, it's not about perfection, but about encouraging the connection between a child and what he sees. Skills will improve, and each moment preserved in a nature journal is precious. things you find outside. You can copy poetry if it comes to mind. You can write little snippets of what you see every day - you don't even have to use complete sentences if you don't want to! C'mon, everyone has a little bit of rebel in them somewhere, right? You can draw scenes, such as your yard when spring starts to visit. 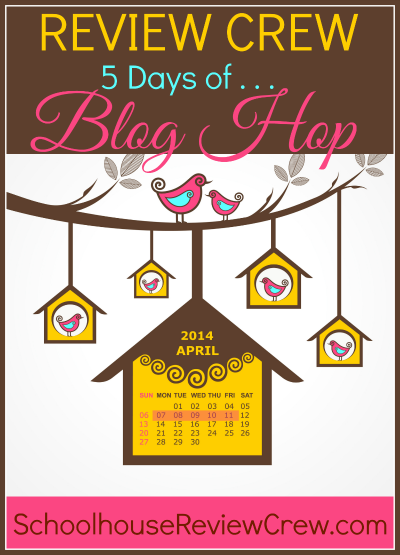 Spend 15 minutes outside first thing every morning, then come in and write your observations. The possibilities are endless. Probably the hardest thing (at least for me) is letting a child be in control of their own nature journal. I'm no great artist and I don't pretend to be able to instruct them in the finer points of technique, but often their connection is not mine. They do have to make some assigned entries during our nature study time, but when they just go outside or we're on a nature walk, they are free to choose. I'm sure my son will have no end of insects and worms in his, and I would really rather see him try to draw flowers, you know? 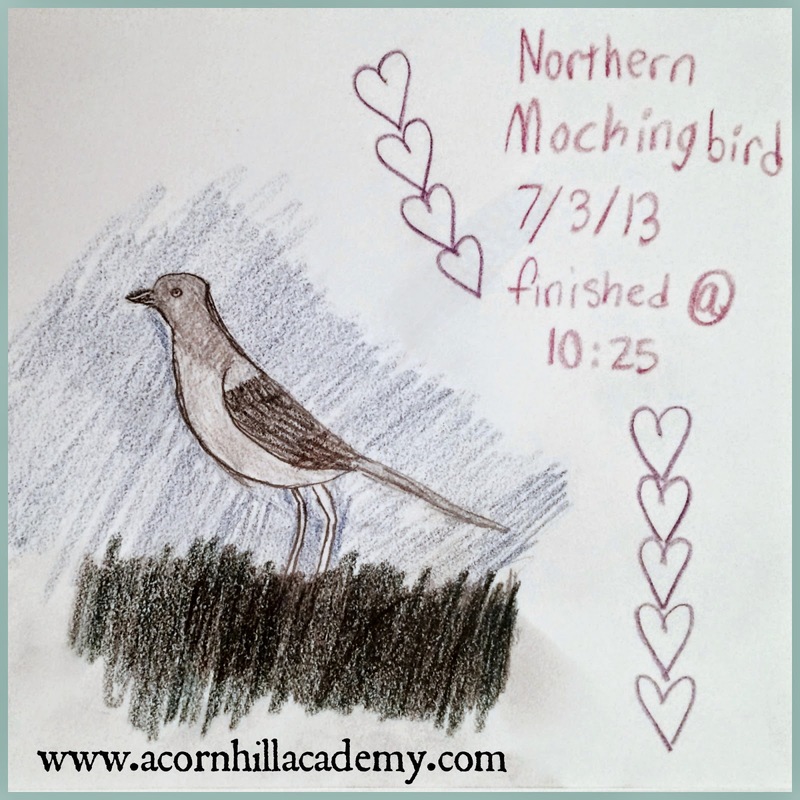 Keeping a nature journal is not only a source of pleasure, but an important piece of a child's education. It will encourage them to be a life-long observer of the world, to become intimate with nature. Just get started - don't let anything hold you back. 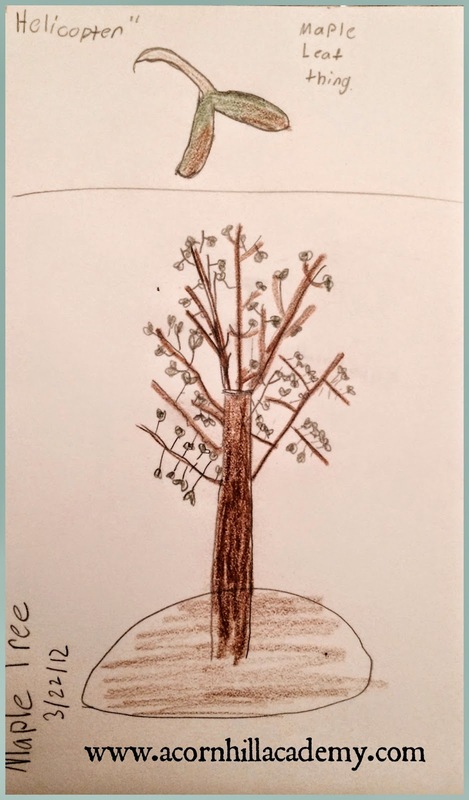 Opening the World through Nature Journaling: Integrating Art, Science and language arts is a nature journaling free curriculum. There is a lot of great information on this website! 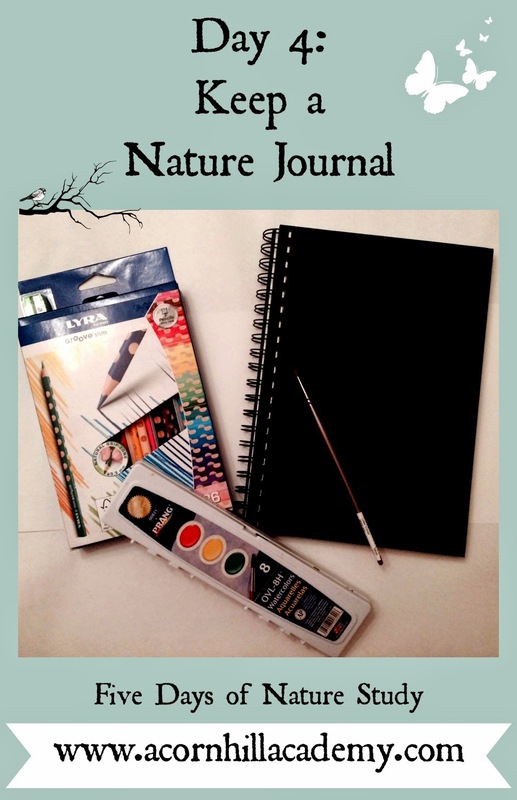 Handbook of Nature Study Blog - Barb shows you how she set up her nature journal, and has lots of links and great information on her website. Check out the Outdoor Hour Challenges! Wild Days: Creating a Discovery Journal (aff. link) by Karen Skidmore Rackliffe is a wonderful book that tells how Karen introduced nature journaling to her children. She brought cookies. Genius! Keeping a Nature Journal: Discover a Whole New Way of Seeing the World Around You (aff. link) by Clare Walker Leslie is a beautiful book about nature journaling.